Honda Japan has released a CR-Z special edition called the Alpha Final Label edition, commemorating the car ending its production, at least for the Japanese market. The CR-Z is currently the only hybrid available with a manual gearbox and has offered one since it first debuted in 2010. In a news release, Honda said that the CR-Z “Final Label” edition will go on sale Japan on June 10 but it’s yet to be known if this variant will be sold outside of the automaker’s home market. There’s no word yet on whether production is also ending for the United States, but do you care? You weren’t going to buy one, anyway. The phrase “reading the tea leaves” is a terrible cliche for many, many reasons when trying to parse out information on the Chinese economy, but it’s a bit apt when you’re trying to find out information the Chinese government doesn’t really release. If we want to truly know what’s going on, we can’t just look at traditional macroeconomic markers. We need to go deeper, and one of those ways is to look at car sales. Growth for car sales in China reached a five-month high in May as auto makers launched new models and dealers continued to offer significant discounts. Car makers delivered a total of 1.79 million passenger vehicles—sedans, sport-utility vehicles and minivans—to dealers in the world’s largest auto market last month, up 11% from a year earlier, the government-backed China Association of Automobile Manufacturers said on Monday. Dealers are still offering a 10 percent discount on new cars, however, so don’t get your hopes up for a truly stable global economy just yet. Nissan, which would prefer Britain to remain in the European Union, said it was “considering the appropriate action to be taken” after a request made to Vote Leave to stop using its logo was denied. A Brexit might not be Nissan’s cup of tea, but has anyone asked the Austin Maestro owners’ club what they think? It turns out that the Mistubishi Outlander plug-in hybrid can be hacked. Mitsubishi’s response? Mitsubishi spokesman Manabu Yamanishi said that because the remote control cannot be used when driving, safety concerns on the road would not be an issue. Also, he said when the doors are locked, the alarm cannot be disabled. The company said no actual cases of such hacks have been reported, but it is alerting vehicle owners about the loophole as it is possible that hackers can disable the theft alarm — if the doors are unlocked — potentially aiding in car thefts. If you can’t crash a hacked Mitsubishi and can only steal it, thus relieving its presence from the lives of its owners, does it still make a sound? Germany’s Daimler will lift the curtain on its much-anticipated long-distance electric car at the Paris Motor Show in October, as the automaker gears up to compete with Tesla Motors Inc’s Model X sport-utility vehicle (SUV). The company will display a prototype of an electric-powered Mercedes car with a 500-kilometre (310 miles) range, Chief Development Officer Thomas Weber said this week in Stuttgart at an event for journalists. 310 miles is a hell of a lot, more than any Tesla I can think of, off the top of my head. It’ll all be pointless without a fast-charging network, but it’ll still be neat to see what the Germans cook up. On this day in 1895, Emile Levassor drives a Panhard et Levassor car with a two-cylinder, 750-rpm, four-horsepower Daimler Phoenix engine over the finish line in the world’s first real automobile race. Levassor completed the 732-mile course, from Paris to Bordeaux and back, in just under 49 hours, at a then-impressive speed of about 15 miles per hour. Neutral: What’s Another Car That Should Have Been Great? 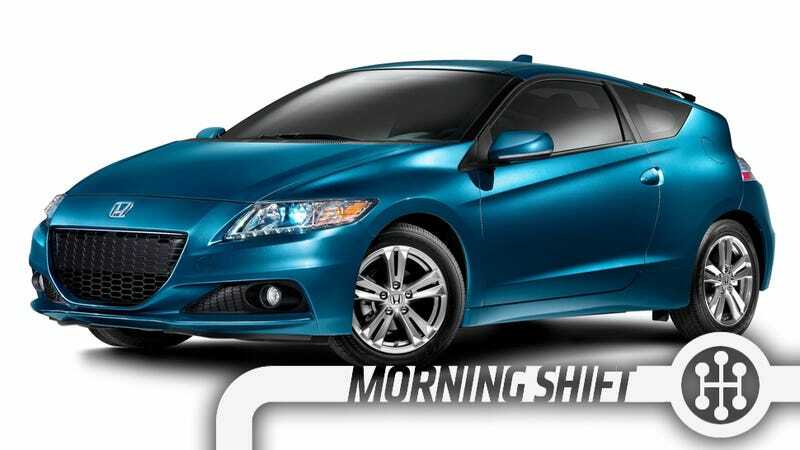 The Honda CR-Z should have been great. But it was too heavy, too slow, not economical enough, not practical enough, and seemed to have been completely designed by committee. It was too much of everything, which meant it was a whole lot of nothing. What other cars were a bit of a camel?